Whew...it has been a busy week. The weather seems to finally be normal for this time of year so that means time is spent outdoors. A lot. Between getting my garden planted, decks stained, baseball games and longer daylight hours, I have been super busy. That means a lot of salads and leftovers. Today was no exception, so by the time 1:30 rolled around I realized I was hungry. I've been eating salad quite a bit but wanted to change up my normal greens with dressing. Once in a while I crave a tuna sandwich, so this is what I came up with. Mix the undrained tuna and avocado in a large bowl. Add the lemon juice and then mix again. 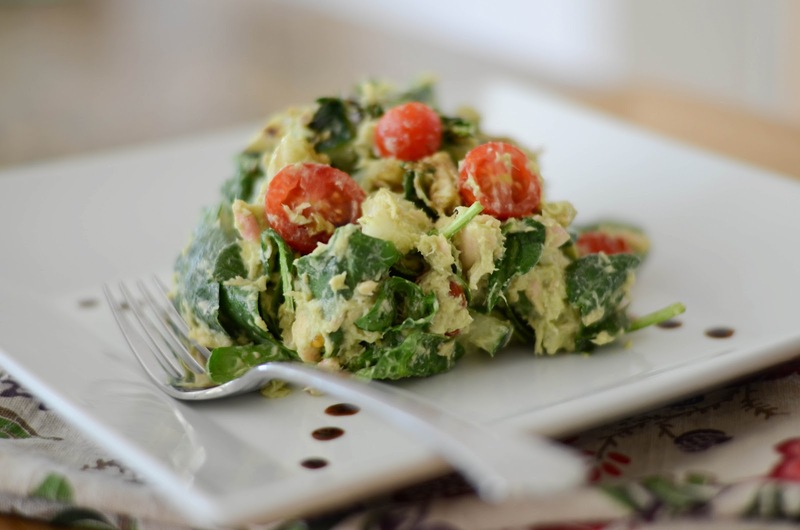 Fold in the tomatoes, jicama, cucumber and spinach until everything is coated well with the avocado dressing. Season with salt and pepper to taste and finish with a drizzle of balsamic vinegar.